Travel is one category where Google is very useful. Type in a flight number such as “United 1111” and Google will return the flight status. Type in “time in Japan” and Google will show the local time there. Google makes converting measurements, be it miles to kilometers or teaspoons to millimeters, easy to figure out as well. 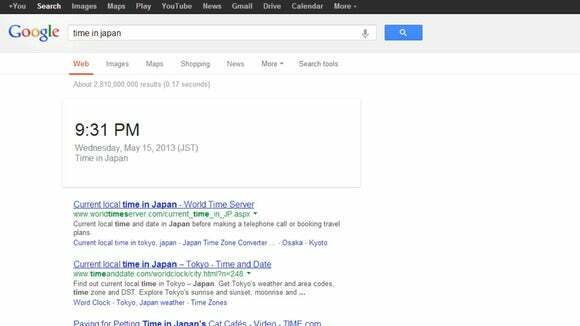 Google will return the local time when, for example, "time in Japan" is entered in the search box. Forcing Google to return more specific results can be achieved by putting a search term in quotations. For example, searching “chocolate chip cookies” will only return results that have those three words in exactly that order. To exclude certain keywords from results, use a dash or hyphen before the word. For example, if homeowners want to find information on windows, but not the Microsoft variety, a search term of “windows -microsoft” will exclude Microsoft from the results. Quotation marks are not needed. Search within a site by using the construction ‘site:cnn.com obama’ which will return articles and stories on cnn.com that relate to U.S. President Barack Obama. To search within a website for keywords use “site:cnn.com obama.” That search (without quotation marks) will return articles and pages that include U.S. President Barack Obama. Search operators such as AND and OR, which are both case sensitive and need to be in capital letters for this sort of search, can be use in queries. For example “ipad AND apple” will return results that include both keywords while “ipad OR apple” will return results that include either word.